potential reactor meltdown, proliferation of weaponizable fuel and unsolved buildup of nuclear waste. As it turns out, the least progress has been made on addressing the waste issue! The concern with nuclear waste is its radioactivity – radioactive elements are unstable and can decay into other elements, releasing energy in the process. In some cases this energy can be threatening to humans or other life close enough to be exposed to the radiation. Waste is categorized according to two metrics: the danger it poses, and the lifetime over which it remains dangerous. Some radioactive waste is a byproduct of medical and research efforts, but the majority is produced through nuclear fission in reactors. The fuel in a nuclear reactor consists of heavy elements, most often U-235 and U-238. This fuel is constantly bombarded by neutrons during the reactor’s operation, which can generate new elements through two mechanisms. The first is nuclear fission – a ‘fissionable’ element may split after it is hit by a neutron. This process, which occurs for the U-235, releases energy and some more neutrons as the nucleus divides into several (often two) smaller nuclei. The resulting elements are called ‘fission products’ (FP). However, neutrons colliding with U-238 will not split the nucleus and are instead absorbed to create a new isotope of the element with one more neutron. Elements created through absorption rather than fission are known as actinides, or ‘transuranics’ (TRU), if heavier than uranium. Over the course of a reactor’s lifetime, many fissions and absorptions occur in various combinations so that the fuel contains an incredible diversity of elements when removed from the reactor core. Many elements created through fission or absorption are very unstable and will quickly decay into more benign species, but a few pose a serious threat over longer timescales, even though produced in small quantities. What alternatives to radioactive waste disposal? A powerful and effective alternative to the prospect of continually searching for and filling of new repositories for the radioactive waste, is to accelerate the change of dangerous waste into more benign elements by transmuting it with neutrons bombardment. A fission reactor is unsuitable for this purpose because the waste acts as a ‘poison’ preventing chain reactions from occurring. Other sources of neutrons are possible, however, including those from nuclear fusion and particle accelerators; we call these processes ‘waste transmutation accelerators’ (WTA). The basic concept of WTA is simply to ‘finish the job’ of burning or transmuting the radioactive waste through intense neutron flux, thereby drastically reducing its radioactivity. Again, bombardment with large numbers of neutrons is considered as a way to either fission the heavier elements into less dangerous species or convert the lighter ones through absorption. The question is, how many and what kind of neutrons are necessary for effective transmutation? The answer depends on the cross sections of the waste elements, where cross section relates to the probability to absorb or fission when hit by a neutron of a given energy. For a low cross section, one must generate more neutrons and use more energy to transmute the offending element. The TRU elements remaining in the waste are generally fairly easy to fission, but the threatening FP’s usually have much lower cross sections for the desired neutron absorption that can transmute them into a more benign state. These elements present a greater concern than the TRUs because they can easily contaminate water and so leaks of radioactive waste can spread much more quickly if they include long-lived FP’s. To transmute them effectively, we propose an attractive alternative that takes advantage of the large amount of usable fuel mixed in with the waste. A new patent application has been filed in January 2016, referring to a new process to produce jointly heat and electricity directly (without a steam cycle) from a safe chain of nuclear reactions including also D-T fusion. This innovative process is currently under development. The research work is based on both numerical simulations and laboratory tests and will lead to the construction of the first prototype of a revolutionary compact co-generator (heat and electricity) based also on D-T fusion, within a few years. Even though the hardest part of the work, achieving the self-sustainment of the reactions chain, needs further theoretical and experimental studies, the ‘core’ of the process, covered by trade secret, has already been studied theoretically and only a short experimental research path is foreseen for its full development. It is a stage that uses thermal neutrons such as those that could be drawn off from any conventional reactor in operation, to trigger a controlled nuclear fusion process that raises the energy level of the neutrons to 14.1 MeV. Obviously the ratio between the number of thermal neutrons used and the high energy neutrons produced is less than 1, but with an energy efficiency for the fraction of neutrons that is possible to treat, that equals 14.1 MeV/0.025 eV; the order of magnitude is therefore 0.35 Mega! It is known that the most harmful fission products (including Americium, Neptunium, Plutonium, Cesium, etc.) and radioactive isotopes of Technetium, Iodine,.. can be split, through fission, in stable elements if, instead of thermal neutrons, high speed neutrons were available, such as those produced by ‘fast’ reactors of the fourth generation. 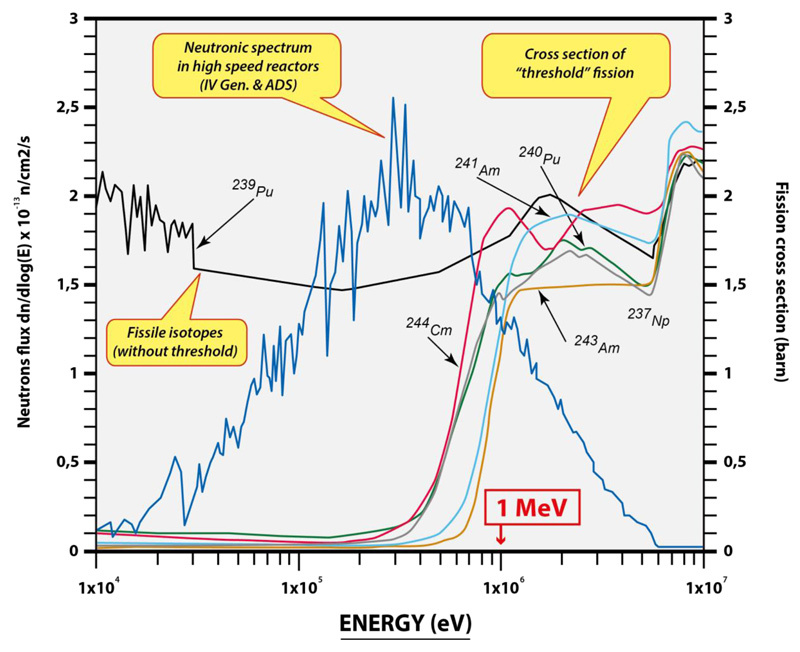 These fast neutrons however have a small part of the energy spectrum superimposed on the graph of the cross sections for the fission of the radioactive elements contained in the waste, as shown in the figure. The graph shows how the right tail of the energy distribution of neutrons from fast reactors (in blue) exceeding 1MeV, is only partially able to overcome the threshold for the fission of nuclear waste. It is evident that the availability of neutrons with energies of the order of magnitude of 10 MeV, produced by D-T fusion in our process, would coincide with the maximum of the cross sections of the main FPs contained in the radioactive waste (extreme right margin of the figure), showing the intrinsic superiority of our process when compared to the fourth generation fission reactors, relatively to the possibility to reduce the radioactive waste. 1. huge reduction of the radioactivity by changing the dangerous waste into more benign elements through high energy neutrons bombardment. 2. production of usable energy. The core process has been recently patented. Meantime a series of laboratory tests has been successfully performed, which confirmed the theoretical model. At the moment we are preparing the last experiment that will allow us to complete the validation of the theoretical and of the mathematical models of the process (Full proof of concept – TRL 3). The experiment will be held in the first months of 2018 and, if we will be successful, it will be then possible to build the first working prototype of the Waste Transmutation Accelerator. After the conclusion of the last test and after achieving the TRL 3 (Technology Readiness Level 3), it will be possible to cooperate with a suitable partner (a company managing nuclear power plants or nuclear wastes would be the ideal partner) in order to apply this innovative technology to build a Waste Transmutation Accelerator prototype inside an operating nuclear power plant, with the objective to demonstrate the effectiveness of the technology and the high ROI.